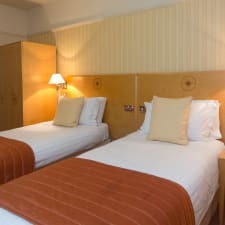 The Imperial Hotel is a three star property located at The Promenade in the city of Llandudno. Housed in a old Victorian building it has views across the bay. It offers 98 ensuite guest rooms, dinning opportunities and space for conferences. Rooms and facilities for people with a disability are available. Each of the guest rooms comes with a 32 or 36 inch flat screen digital television with freeview channels, mineral water, hospitality tray, direct dial telephone, free wireless internet access, bathrobe, slippers and a hairdryer. Guests can enjoy breakfast served daily but also dinner at one of the two onsite restaurants. Lunch, snacks or just a cup of coffee or tea are also available during the day. Guests can relax and enjoy at the health & Leisure Mint Condition centre where guests can find an indoor swimming pool, two gyms, a spa bath, sauna and steam room. Conferences can also be hold at the hotel for up to 150 people. Other facilities include 24 hour front desk, safety deposit box, luggage storage room and room service. Free parking is available at the hotel.